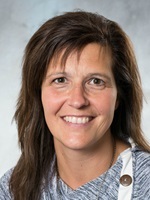 Heidi Douma serves as the director of Northwestern's online bachelor's degree program in early childhood. A member of the college's education department faculty, she also teaches elementary education, early childhood education, and special education classes. Douma has 17 years of experience as an early childhood special education teacher. While at the Sibley-Ocheyedan Community School District, she taught pre-K, 4-year-old preschool, and early childhood special education and designed and implemented the school district's pre-K/transitional kindergarten program. She also served as an early childhood special education teacher for the Northwest Area Education Agency for seven years. She has made presentations to the Iowa State Reading Convention on inclusion in the preschool classroom, as well as at the Iowa Association for the Education of Young Children Conference and the Iowa Reading Council. A Northwestern College graduate, Douma holds a master's degree in curriculum and instructional leadership from Buena Vista University.